I want to begin by acknowledging to everyone what a great job the National Weather Service did with Hurricane Florence. And, the forecasts and messaging for Florence from the entire meteorological community represented a huge step forward. Florence also demonstrated the minority of people who believe we can take human meteorologists out of the process are wrong, very wrong. Some of the computer models were way off early in the process yet human forecasters knew how to correct for those issues. We are going to need human forecasters, especially in storm or unusual circumstances, as far into the future as I can see. Regardless of that huge step forward, there were a vocal few people who were upset -- some very upset -- about the television, WEA, and Twitter warnings for Hurricane Florence. Those are a couple of the civil tweets. Some were downright mean. While I know we cannot please everyone, I'm not sure these people people want. The forecasts, including that it would take days for all of the rivers to crest, were excellent. See here and here. The issue I have is that first responders have to go in, risking their lives, to rescue these skeptics. A fine of $500/household if rescued by boat. Fine of $1,000 if rescued by a helicopter. 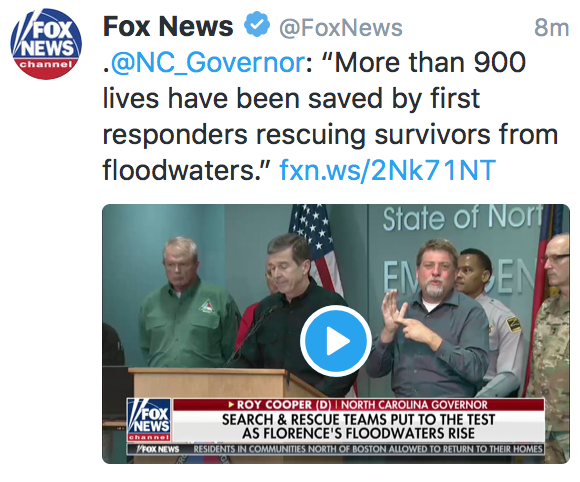 The death toll of 33, while tragic, is tiny when compared with the Florence's potential. 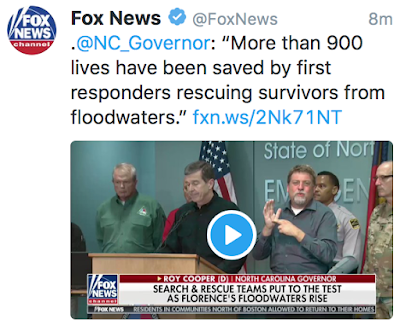 Combine that number with the 900+ rescues so far plus the fact that most people evacuated and you can easily imagine a death toll of 1,000+ had the forecasts been off. 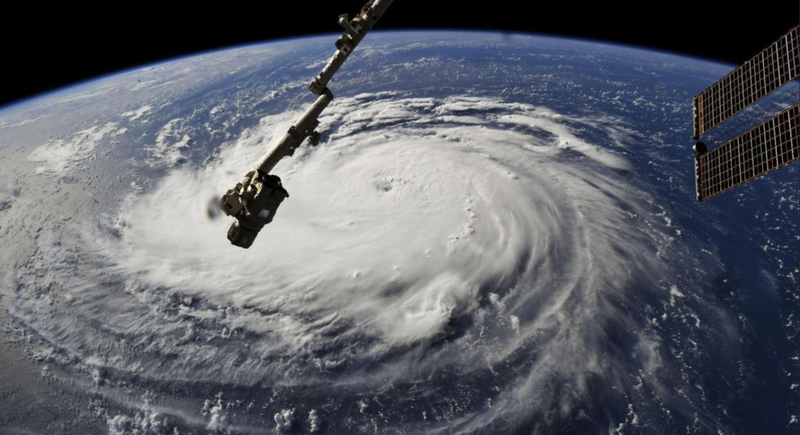 Weather science likely saved 1,000+ deaths in Florence. Regardless of location, go buy your favorite meteorologist a beer or send them a congratulatory note. It will be greatly appreciated. Note that I am not congratulating the climate community. The behavior of some during Florence was disgraceful: trying to politically tie Florence to President Trump or global warming. 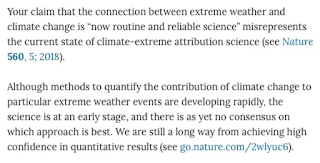 Dr. Judith Curry -- an expert in the field -- published a piece on her blog yesterday agreeing that there is little evidence to tie Florence to global warming. Her conclusion is below. Her entire piece is here. I’ve scratched the surface of the complex issues surrounding the weather and climate dynamics of Florence, but the take home point is that convincingly attributing any of this to human caused global warming is very challenging, and the strategies used by the mainstream climate community to do this ... are woefully inadequate and misleading to scientists, the public and policy makers. Dr. Curry is not the only one. 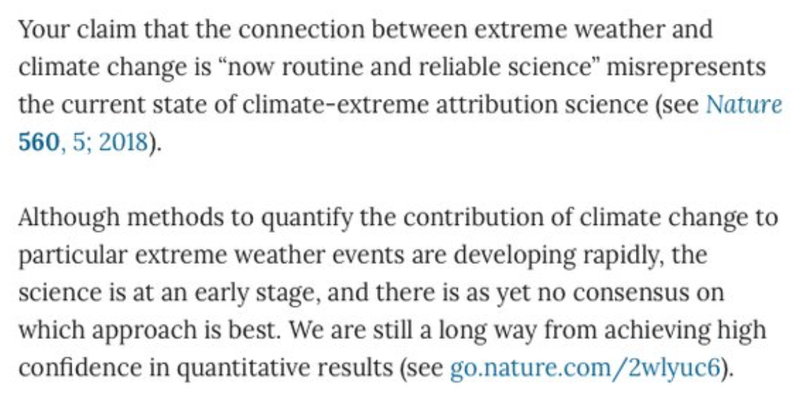 Here is an excerpt of a Letter to the Editor of Nature which was part of the "global warming caused/made worse Hurricane Florence" crowd. This will get a tiny fraction of the publicity than the original, unscientific claims. Global warming has contaminated the field of atmosphere science, to which I have given my career, and it saddens me greatly.